AIRAID Drop-In Replacement Air Filters install into your vehicle’s factory air box and are drop-in replacements for stock paper filter elements. AIRAID replacement filters require no modifications and installation is as simple as replacing a stock filter. Constructed using the same premium materials used in AIRAID Cold Air Intake Kits, these washable and reusable air filters offer significant improvements in air flow while providing outstanding filtration. You can upgrade to a reusable AIRAID Premium Filter often for less than the cost of two stock replacement filters. 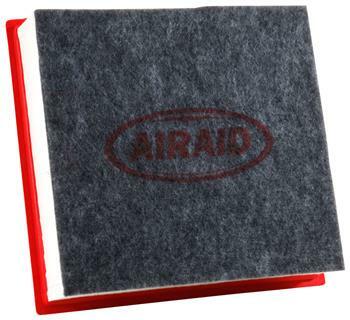 Every AIRAID Reusable Air Filter is hand-built using the finest materials available today. AIRAID Reusable Filters come with a Lifetime Guarantee. These air filters are available in either an oiled cotton/synthetic filter media blend which is recommended for dusty, dry driving conditions or in a dry synthetic filter media which is recommended for everyday street use. AIRAID Reusable Filters are built to last “for a lifetime” guaranteed. Each AIRAID Reusable Filter body is made from hand-poured urethane that won’t crack or shrink in the high-heat environment found under the hoods of today’s vehicles. Each AIRAID Reusable Filter is 100-percent washable and reusable and come with the AIRAID® “NO-Hassle” Lifetime Limited Warranty. Direct replacement for the OEM paper air filter, these AIRAID long-life disposable air filters offer significant improvements in protection and filtration over the standard paper air filters. Manufactured with stabilized synthetic blend filter pleats for increased air flow, these disposable air filters offer a secondary non-woven synthetic pre-filter for added protection and long-life performance. Their multi-stage low restriction synthetic filter media traps dirt while providing excellent airflow and can hold up to 50% more dust than a traditional paper air filter. As with the AIRAID Drop-In Reusable filters, these long-life disposable air filters require no modifications and installation is as simple as replacing a stock filter. AIRAID Disposable Filters meet or exceed OE factory specifications and come with an AIRAID® “NO-Hassle” 12 month/24,000 mile limited warranty.